Students worked in teams of two or three to create their impromptu finger puppet skits today, and we used iPad2 video production teams of two students. For those shooting video, we found it worked best when one student had sole responsibility for holding the iPad still with two hands. We eventually figured out it worked best to rest the iPad on the table. As we’ve done previously, we marked the boundaries of the “finger puppet stage” using yarn taped to the table. The second student on the videography team had responsibility for getting the room quiet before starting recording, and starting as well as stopping iPad recording. In one case, a student videographer covered up the iPad’s microphone with his finger during recording and we couldn’t hear anything the puppeteers said. Thankfully that particular group had several “takes” of their skit, so we were able to use another take which had better audio. The audio was ok without an external microphone, but I might try using an iRig with an external mic at some point down the road. It was certainly simpler to not mess with an external microphone, as the puppet actors could focus just on their dialog and puppet movements, without needing to juggle a microphone. 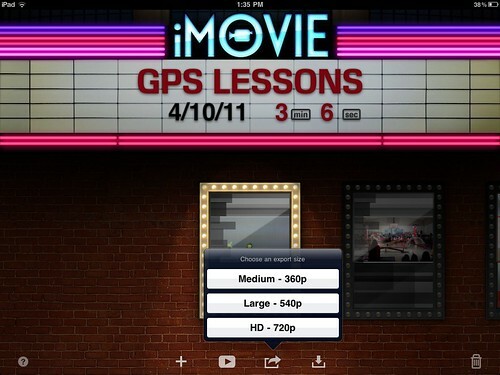 iMovie for iPad is a dream to use. Compared to the time required to import video from an external recorder, sequence the clips, etc, editing on the iPad was MUCH faster. 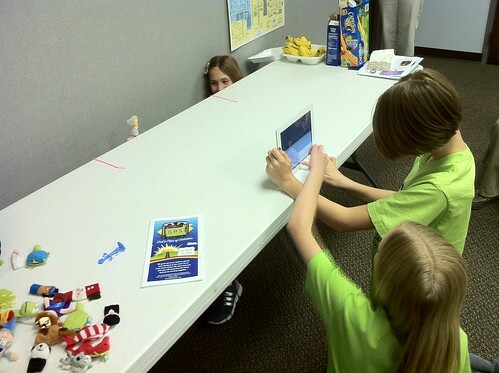 Students boosted the volume of most clips, since students had been literally “under the table” when recording their skits. This helped quite a bit. I had used iMovie for iPad previously, so I was able to talk them through the process of splitting a clip by selecting it, moving the playhead where you want the split to go, and then swiping your finger down to split the clip at the playhead location. Using this technique, students quickly trimmed clips which had extra time at the start or end. They also removed some quiet time from a clip in which the actresses had consulted each other about dialog during their recording. 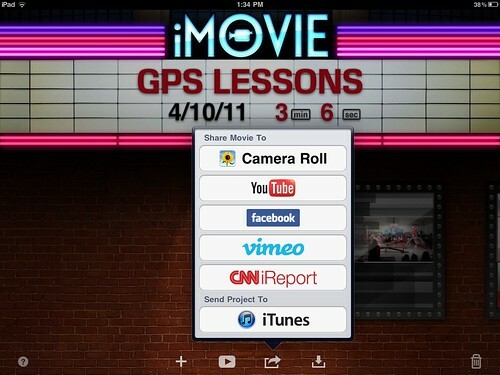 It’s GREAT iMovie for iPad provides multiple publishing options / targets in addition to MobileMe. As you can see in the screenshot below (hopefully, as long as Flickr is not blocked in your current location) these targets include YouTube, Vimeo, Facebook, the iPad’s Photo roll, iTunes, and the CNN iReporter website. Since we’ve published our previous finger puppet videos there, I chose Vimeo today. 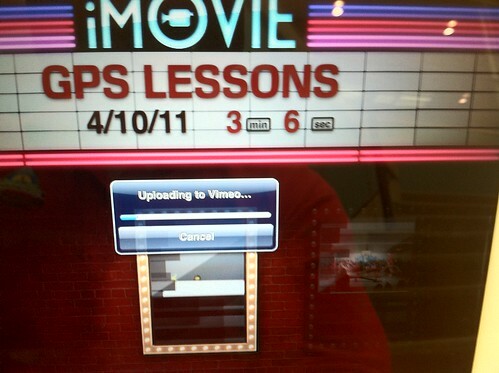 After choosing a publishing destination, logging in and setting the title / description / tags for the video, iMovie for iPad prompts users to select the video export size. Today I chose “large,” since this would keep our file size (and therefore required upload time) smaller and we really didn’t need more resolution in the final movie. I uploaded the video from home, because our Internet connection at church was a little pokey, but all the editing was completed by our students in about 10 minutes after class. Of course this was a three minute video, and it was not very polished. Still, it’s both remarkable and wonderful that students were able to completely edit our in-class video today so fast on the iPad. There is no way they could have done this as easily and quickly on a desktop computer. To share this video on our class blog as well as the team Christian blog to which I periodically contribute, I used email and a free account on Posterous.com. Since I’d already configured my account to cross-post to these blogs, I simply needed to email the link to our video directly from iMovie (after it uploaded to Vimeo) using the correct email addresses. These were “post@eyesright.posterous.com” and “post@blastcast.posterous.com.” That email created two identical posts on both WordPress blogs. The one surprise was that initially, the Vimeo video on the blog was set to private. I had to log into our class Vimeo account (free, by the way) and change the privacy settings for the video so ANYONE can view it. I also changed the account defaults so in the future, uploaded videos should automatically be set for anyone to view. Overall this was a great experience, and a fun way for our students to both record and share their “lessons learned” from the amazing musical our kindergarden through fifth graders shared today during both our morning services. As you might expect, the students were VERY excited to not only have a chance to do more finger puppetry related to our lessons, but also record for the first time in their lives (for most of them, except my daughter) on an iPad2. 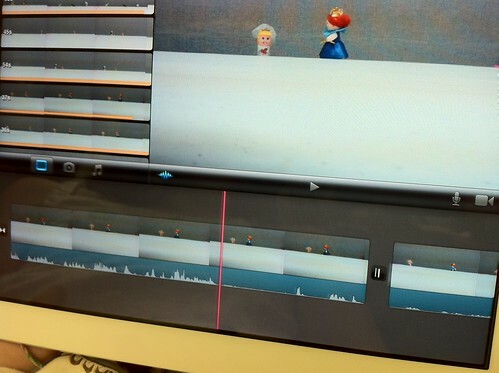 Have you started experimenting with an the iPad2’s videography capabilities with your own students, and helped them use iMovie for iPad for editing? If so, what are your initial impressions?